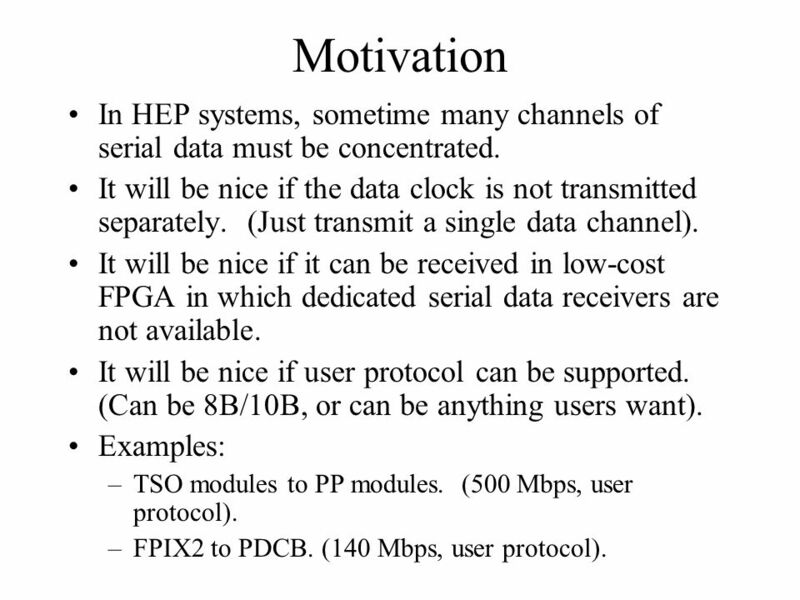 2 Motivation In HEP systems, sometime many channels of serial data must be concentrated. It will be nice if the data clock is not transmitted separately. (Just transmit a single data channel). It will be nice if it can be received in low-cost FPGA in which dedicated serial data receivers are not available. It will be nice if user protocol can be supported. (Can be 8B/10B, or can be anything users want). Examples: TSO modules to PP modules. (500 Mbps, user protocol). FPIX2 to PDCB. (140 Mbps, user protocol). 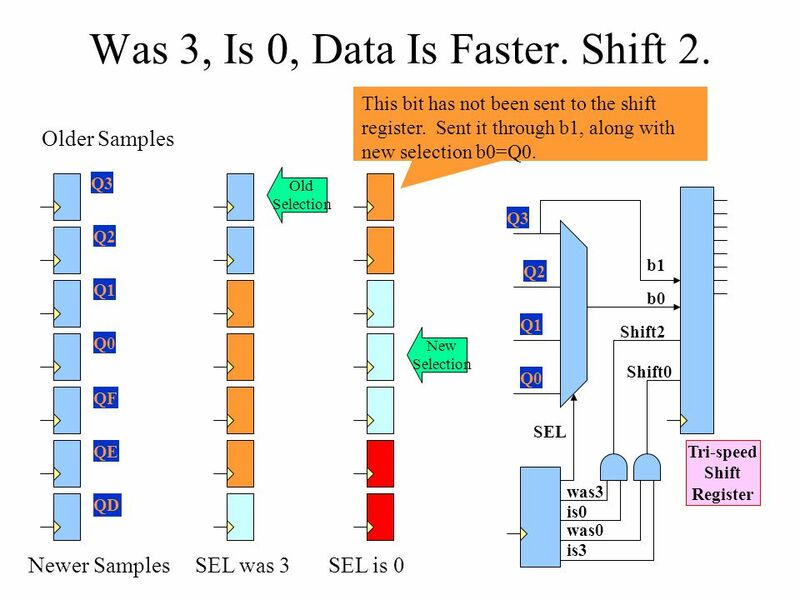 3 Receiving Serial Data Data channels are de-serialized using shift registers. 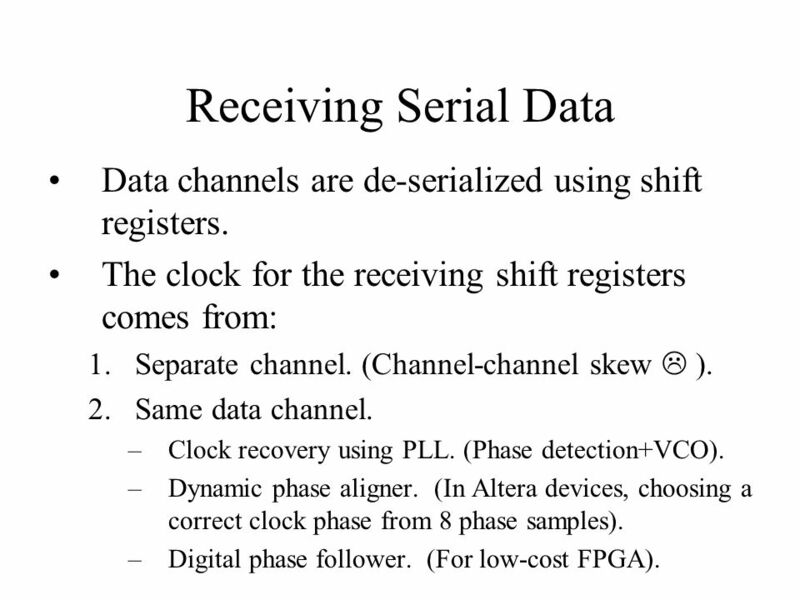 The clock for the receiving shift registers comes from: Separate channel. (Channel-channel skew  ). Same data channel. Clock recovery using PLL. (Phase detection+VCO). Dynamic phase aligner. 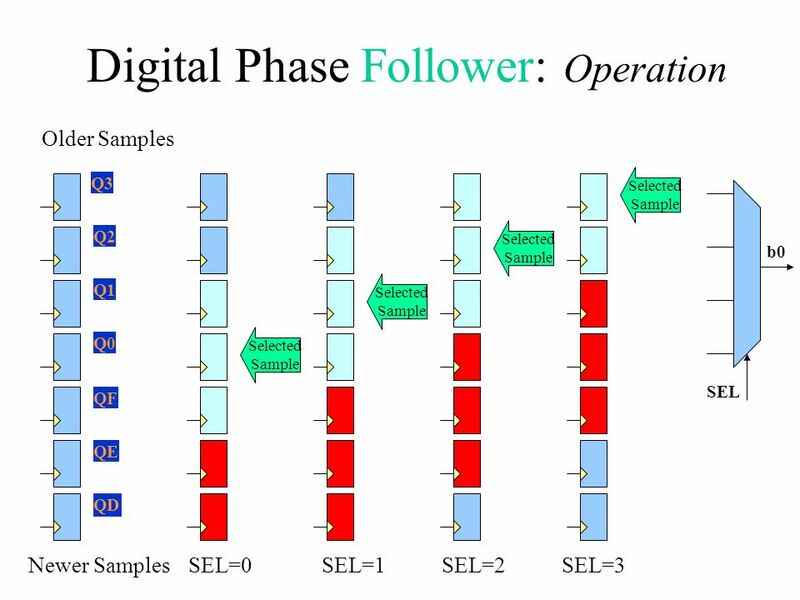 (In Altera devices, choosing a correct clock phase from 8 phase samples). 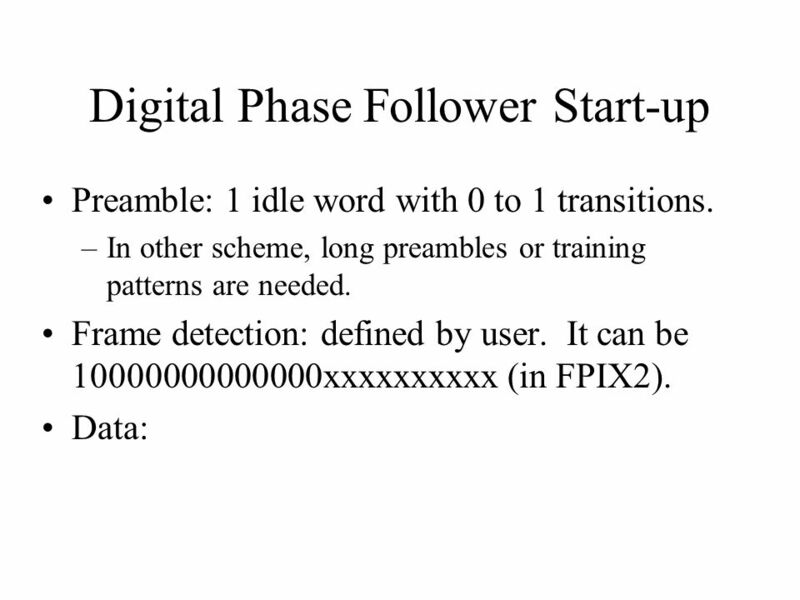 Digital phase follower. (For low-cost FPGA). 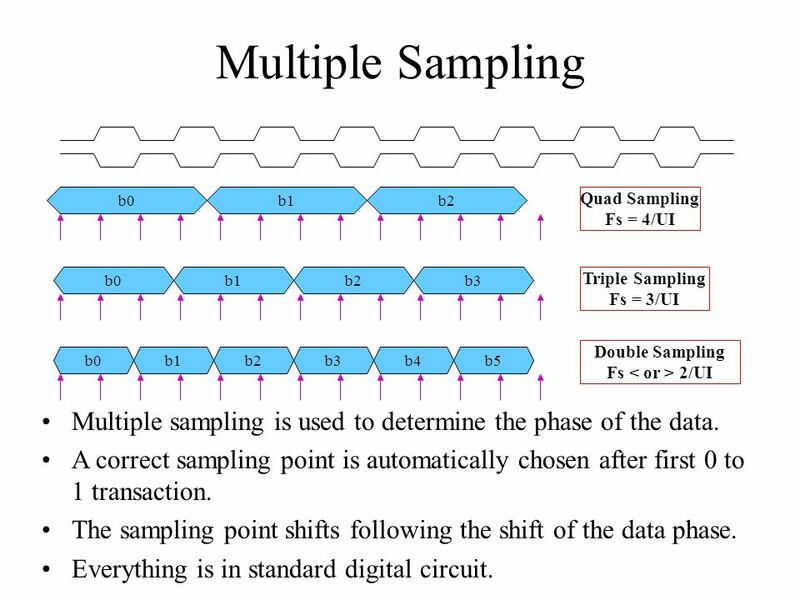 4 Multiple Sampling b0 b1 b2 Quad Sampling Fs = 4/UI b0 b1 b2 b3 Triple Sampling Fs = 3/UI Double Sampling Fs < or > 2/UI b0 b1 b2 b3 b4 b5 Multiple sampling is used to determine the phase of the data. A correct sampling point is automatically chosen after first 0 to 1 transaction. 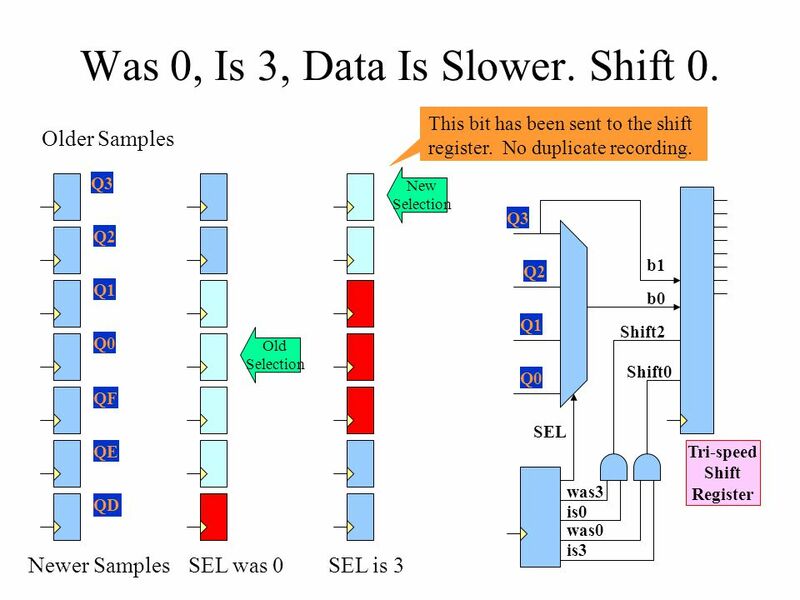 The sampling point shifts following the shift of the data phase. Everything is in standard digital circuit. b0 b1 b2 Quad Sampling Fs = 4/UI b0 b1 b2 b3 Triple Sampling Fs = 3/UI Double Sampling Fs < or > 2/UI b0 b1 b2 b3 b4 b5 In digital phase follower, since no clock recovery is needed, 4, 3 or 2 samples per bit (unit interval) are sufficient. (Not 8). 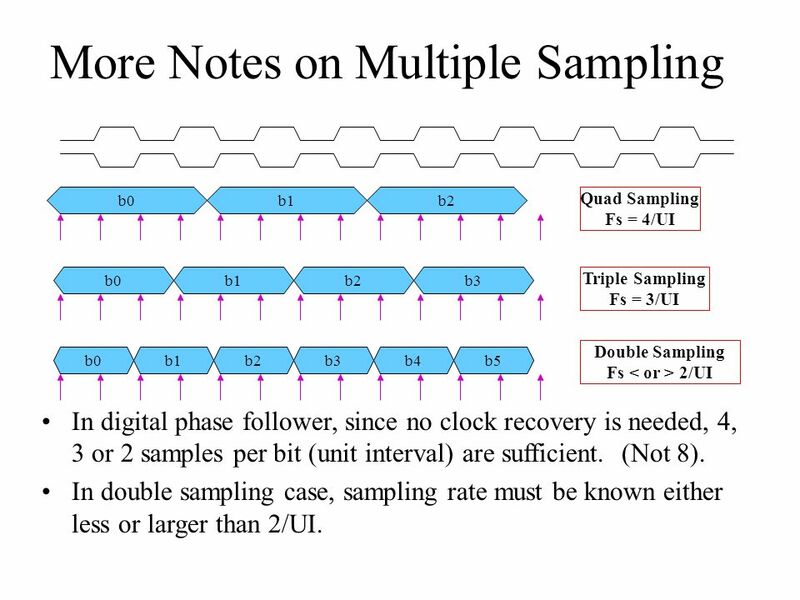 In double sampling case, sampling rate must be known either less or larger than 2/UI. 8 Was 0, Is 3, Data Is Slower. Shift 0. 9 Was 3, Is 0, Data Is Faster. Shift 2. 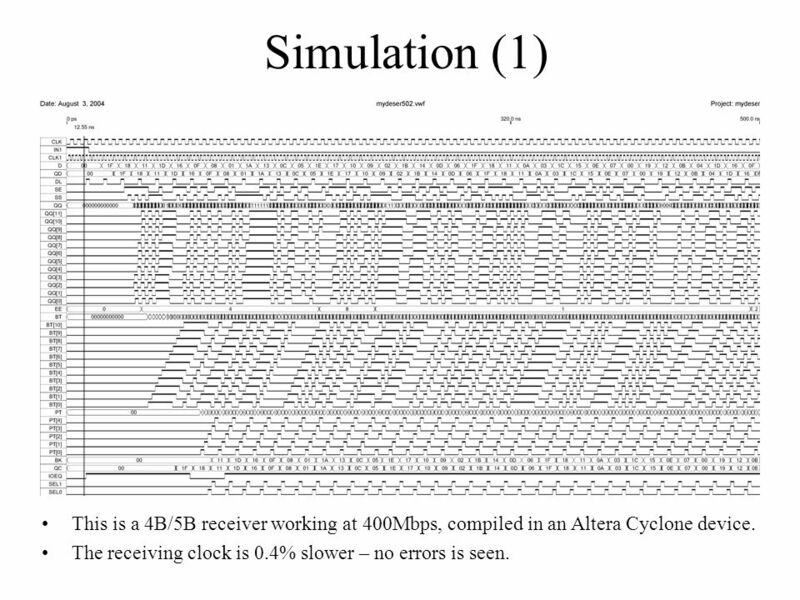 10 Simulation (1) This is a 4B/5B receiver working at 400Mbps, compiled in an Altera Cyclone device. The receiving clock is 0.4% slower – no errors is seen. 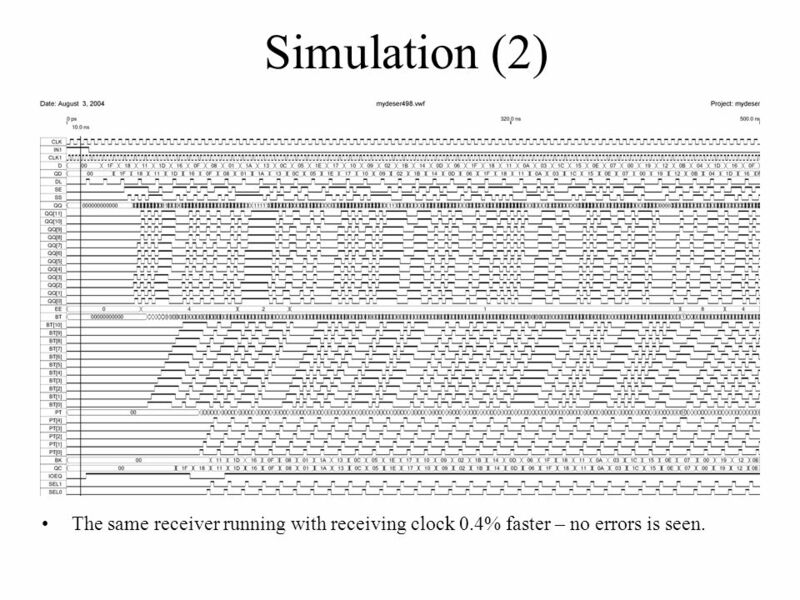 11 Simulation (2) The same receiver running with receiving clock 0.4% faster – no errors is seen. Data is self-timed, no separate clock transmission is needed. 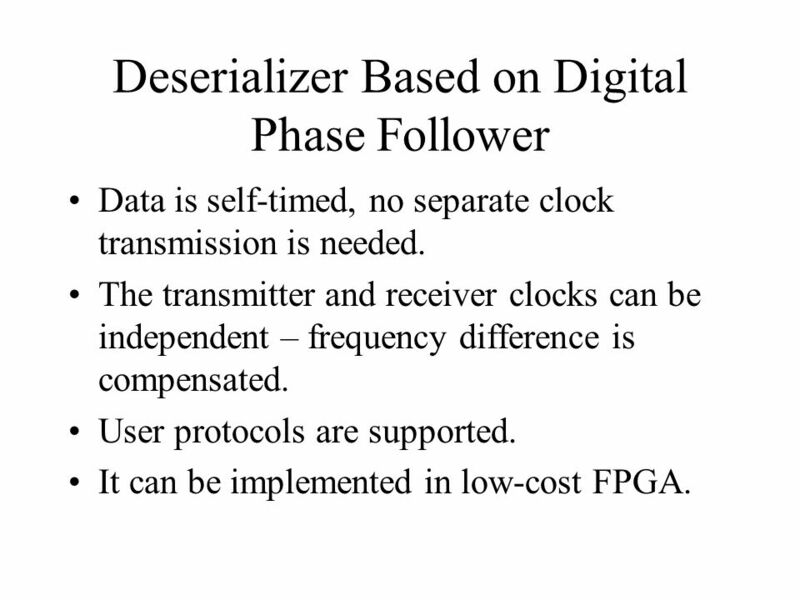 The transmitter and receiver clocks can be independent – frequency difference is compensated. User protocols are supported. It can be implemented in low-cost FPGA. 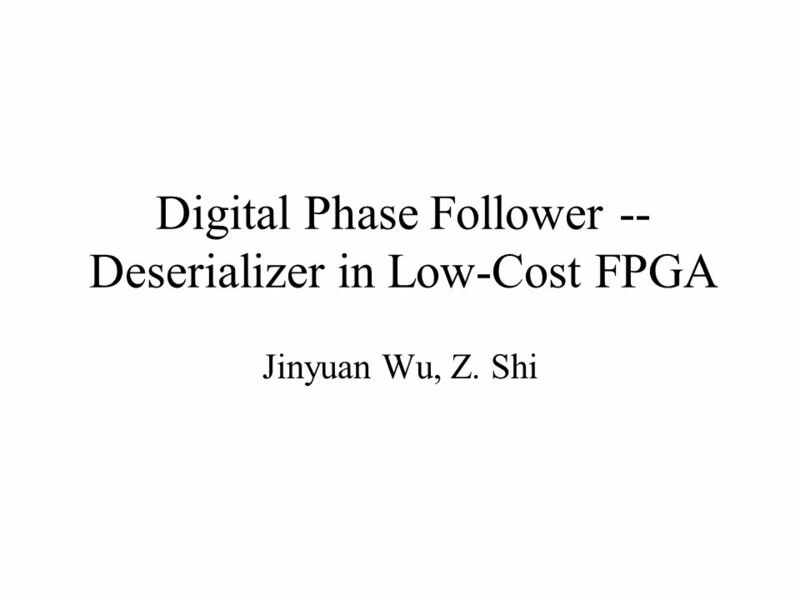 Download ppt "Digital Phase Follower -- Deserializer in Low-Cost FPGA"
Physical Layer II: Framing, SONET, SDH, etc. 1 PIANO+ OTONES WP3 SIGNAL PROCESSING ALGORITHMS. Data Communication Topics to be discussed:  Data Communication Terminology.  Data Transmission Signals.  Data Transmission Circuits.  Serial & Parallel. Digital Systems Design VHDL in Bluetooth Baseband Module by Marc A. Mackey. 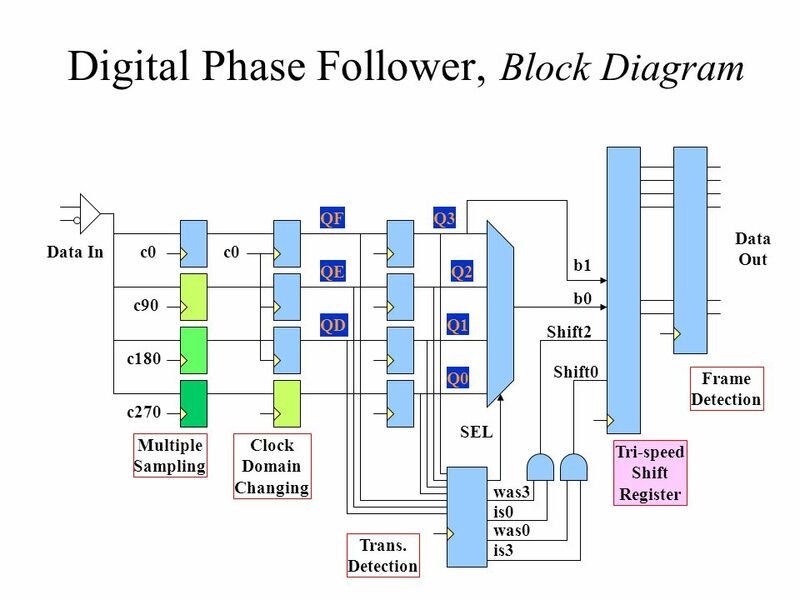 Shift Register Application Chapter 22 Subject: Digital System Year: 2009. D Channel Data Link Protocol Link access procedure on the D channel - LAPD. DUAL-OUTPUT HOLA MAY 2011 STATUS Anton Kapliy Mel Shochet Fukun Tang. High Speed Digital Systems Lab Spring/Winter 2010 Midterm presentation Instructor: Rolf Hilgendorf Students: Elad Mor, Ilya Zavolsky Integration of an. William Stallings Data and Computer Communications 7 th Edition Chapter 1 Data Communications and Networks Overview. Transmission Modes Different ways of characterizing the transmission. High Speed Digital Systems Lab Spring/Winter 2010 Part A final presentation Instructor: Rolf Hilgendorf Students: Elad Mor, Ilya Zavolsky Integration of. 7-1 Digital Serial Input/Output Two basic approaches  Synchronous shared common clock signal all devices synchronised with the shared clock signal data. McGraw-Hill©The McGraw-Hill Companies, Inc., 2004 Chapter 4 Digital Transmission. May 17, 19992 USB 2.0 Transceiver Macrocell Steve McGowan - Intel Corporation Clarence Lewis - Texas Instruments Steve McGowan - Intel Corporation Clarence.